We were close to ready to launch a larger robot boat when Hurrican Irma destroyed our shop room. 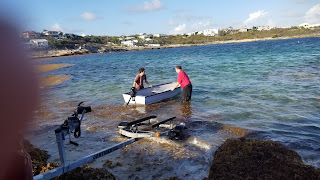 The above video shows our phone app controlling two trolling motors. Below is video from during Irma. So a lot of extra work after Irma and it took awhile to even get glass back on the shop. 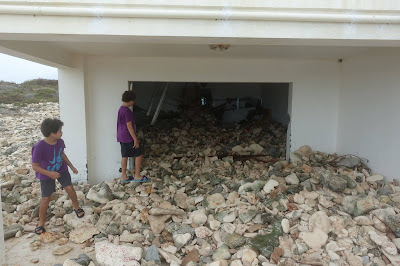 At the same time that many islands needed lots and lots of new glass the main glass place for these islands in Puerto Rico was destroyed. This is a 1/6th scale model of a design that fits in a 40 foot container. Next post should have this motoring around on its own. Hurricane Irma in Sept 2017 wiped out our guest room which we were using as a workshop. For several months power and Internet were issues. Anyway, it is really almost 8 months later that we are really feeling recovered. We have a second grey boat that is to be our "chase boat" to follow the blue robot boat. We had a long delay in getting a 4WD car, and then we had to get trailer hitch onto the island and installed, then the 4WD did not really work, then hurricane, etc. 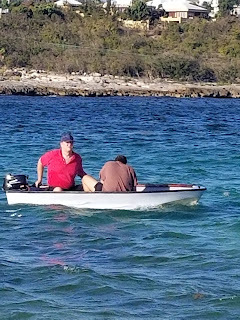 We finally tested the chase boat today. Pictures below. We got our cute new boat today. In the picture above it is still in the boat yard where it was made. Thanks "Country" we love it! 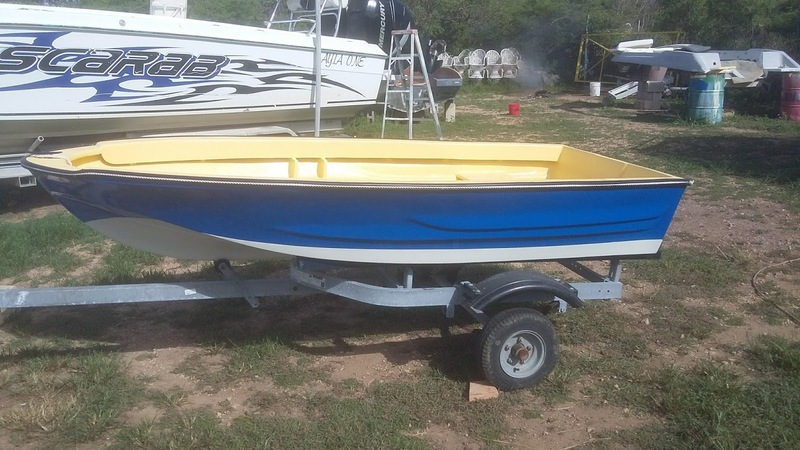 If anyone needs boat work he is East of the pond in Sandy Ground, just look for a yard with lots of boats. We love it so much we ordered a second one. This picture is at our house with Corey, Amoni, and Ethan. 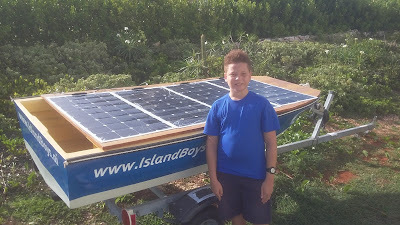 Below we are checking a 100 watt solar panel for size. 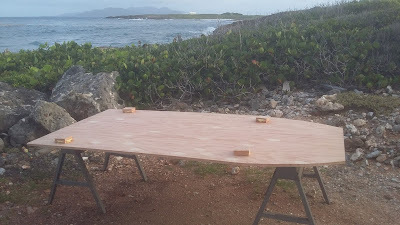 We are probably going to put some marine plywood across the top to put the solar panels on. I think we can fit 4 of the 100 watt and 1 of the 50 watts panels for a total of 450 watts of solar. We might do less at first so we can have humans aboard. 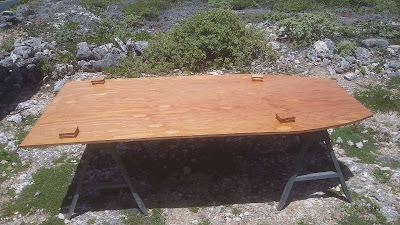 After a coat of resin (July 16, 2017). Did this underside early in the morning in the shade. Did the top side in the mid-day sun and the resin suddenly hardened in the pot right as I was finishing. In the future I think I want to only play with resin in the early morning shade. 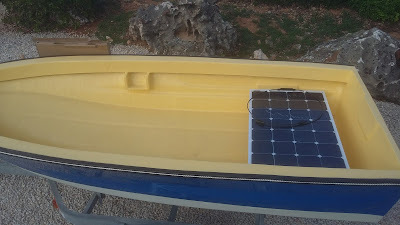 Fits on the boat and can hold 4 of the 100 watt panels (July 16). Going to get some stainless steel screws and some more resin. Tested out 4WD at the beach and it did not work (July 16). Will take the jeep to a mechanic. This is the spot we will launch at. 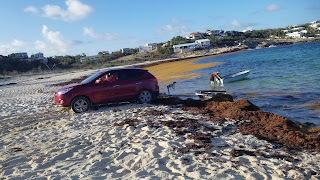 We can bring a pitchfork to get seaweed out of the way of the trailer. Getting the boat through that much seaweed will also be an issue. 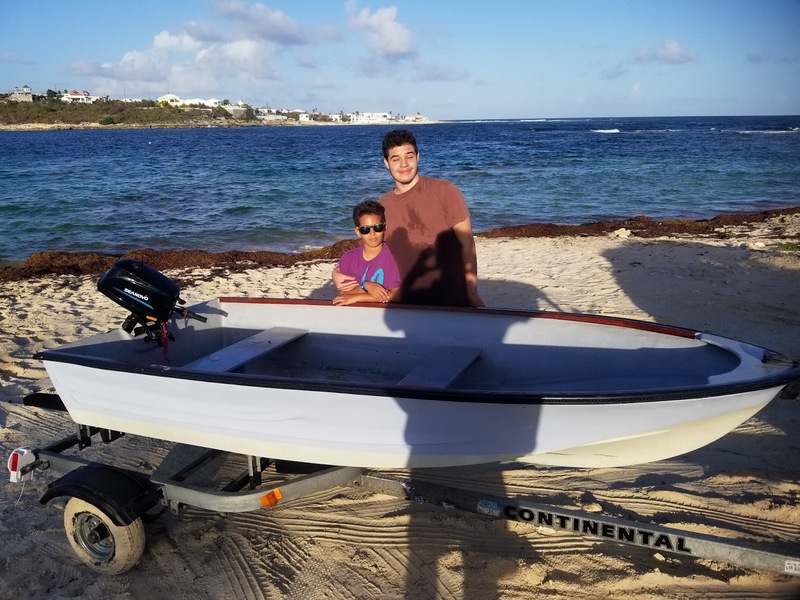 We got a second boat but our 4WD vehicle is still at the shop (as of Aug 25, 2017). One problem with living in paradise is it can take awhile to get parts. We should get a second trailer Tuesday. But by the time we decided "Country" (he is East of pond in Sandy Ground) had sold that one to someone else. But he has a mold and so can make more and is now making one for us. 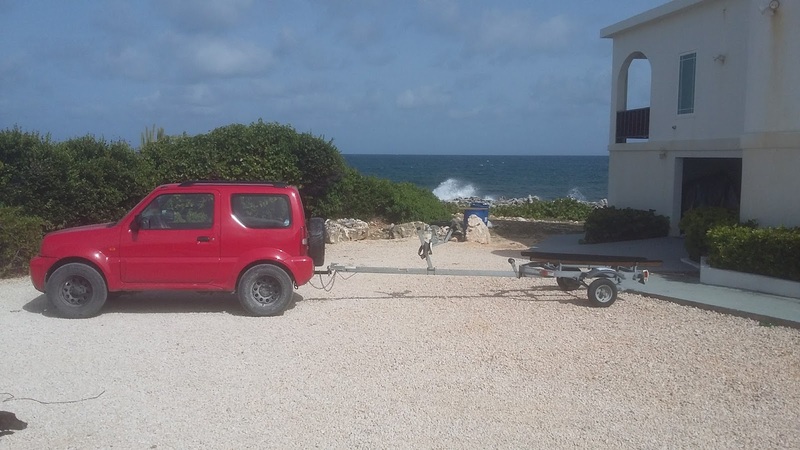 We got a trailer shipped over from St Marten. 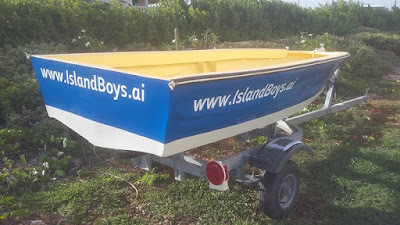 Island Waterworld does not take Bitcoin but I could convert Bitcoin to Paypal. :-). We got a trailer hitch put on Leslie's jeep (Crispin in Rey Hill did a nice job). 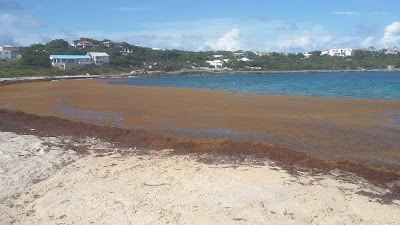 It is a very short drive from our house to Sandy Hill Bay beach, so we will launch there. Our new "maker room" has a nice view of the ocean and airconditioning. With all these cool electronics I can't understand why it is not more popular on couchsurfing.com. We tested our phone app with a Bluetooth motor controller hooked up to 2 solid state relays which in turn controlled the trolling motors. All seems to work fine. The phone app is the same one we wrote for the smaller solar robot boat. Just a tiny bit of electronics to control a big 9 foot robot, eh? Phone has computer, display, GPS, compass, communications, camera, etc. in one small package that was already on hand. 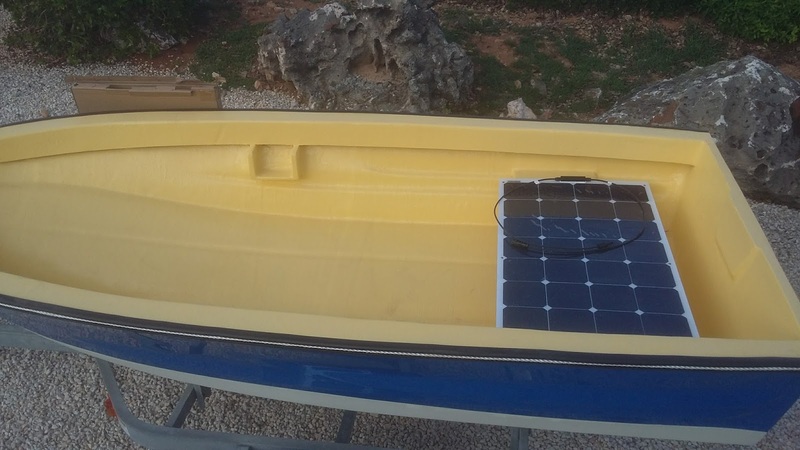 We will add solar to this boat too. 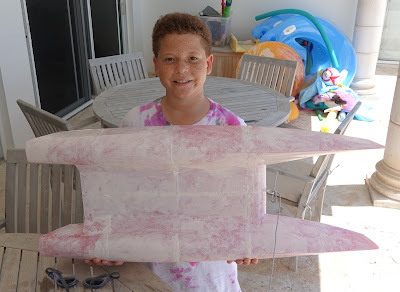 We have 3D printed pieces for a catamaran and a swathy design. We glued the pieces together using gorilla glue and clamps to hold while the glue foams up and hardens. Then we paint the whole thing with styrospray to make sure it is waterproof. Both the swathy design and the catamaran were weighted down with cups of gravel to 2.56 kg. The catamaran did not take much weight, about 1/10th kg. The swathy design was close to 1/2 kg of gravel. The above video shows the setup. 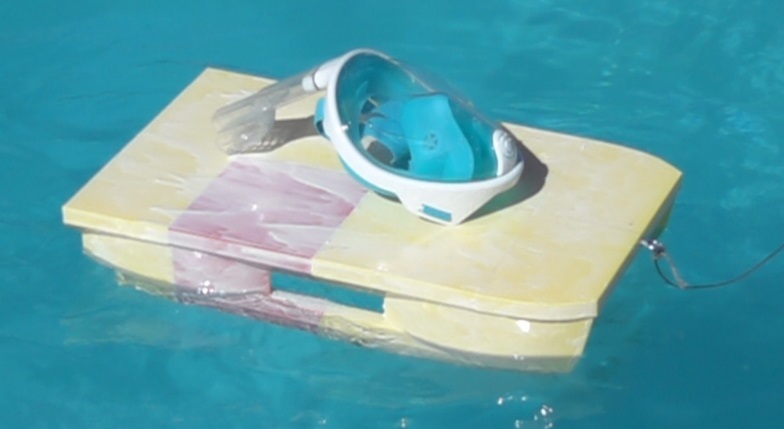 We make the waves at one end of the pool using a 12 inch diameter PVC pipe. The tension holding the models in place is just from the weight of a rope to the top of a lounge chair. The "infinity pool" edge dampened the waves some but we had the pump off because it was making waves and with the pump off the pool soon got below the edge so only large waves went over. The camera for most of the video was on the tripod in the middle of the infinity overflow. I think the following videos should be viewed full screen and you can also use youtube to slow them down by a factor of 4 to study interesting parts. Then two older models. I did not actually use the best of my older models but it then got windy and so other tests will wait till next week. The orange model with 4 floats is 8 lbs. It should have been weighted down to about 12 lbs for optimal stability. Maybe in a future test. 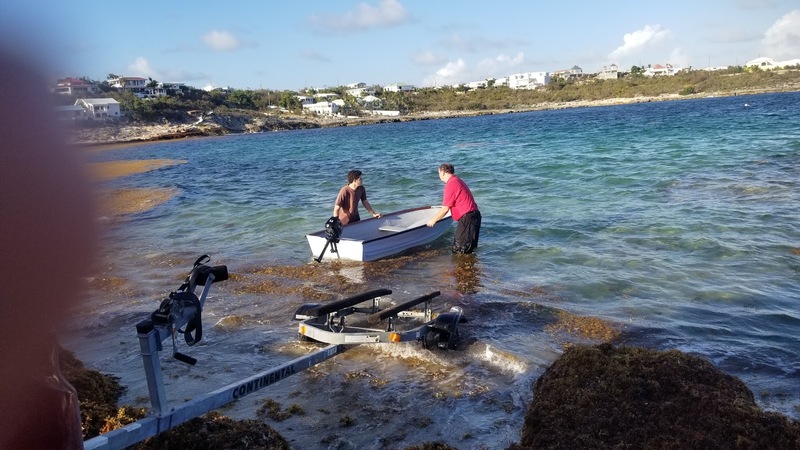 In these videos the catamaran really looks good. It is hard to beat but I still want to try. This next video the model on the left is 4 lbs with 1.1 lbs of gravel in cups for a total of 5.1 lbs. 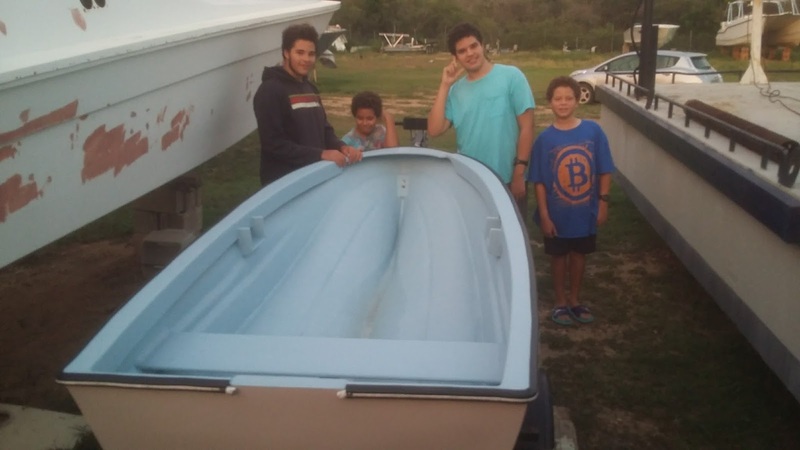 The catamaran total is 5.64 lbs. This one does well against the catamaran. 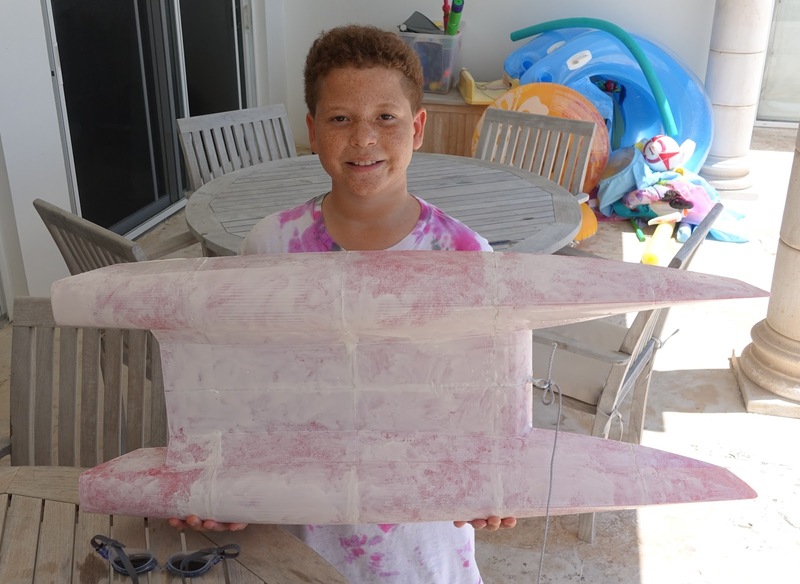 With the latest 3D printed floats we have a new model and tested it in several different wave conditions. These videos were shot at 8x and then slowed by 1.5 for a net slowdown of 5.3. This is about right for the scaling factor of this model. 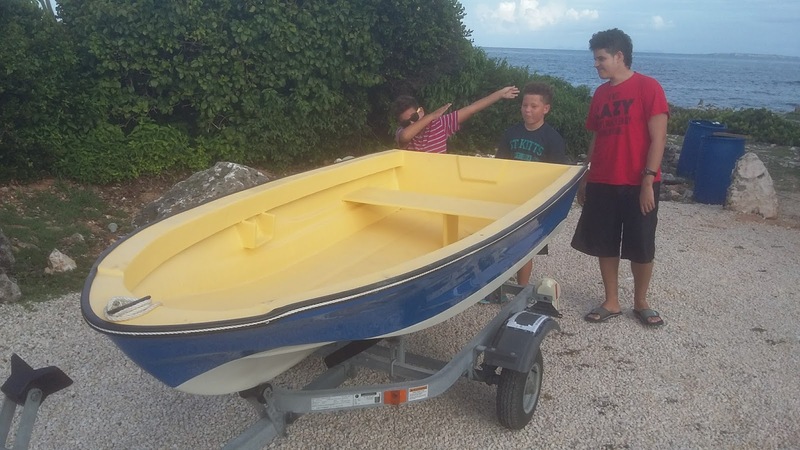 So how fast you see the model tipping is how fast the full scale boat would tip in full scale waves. 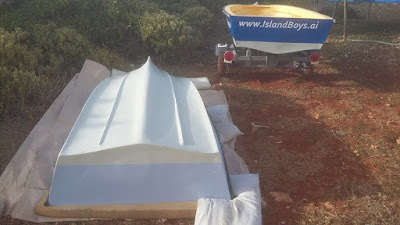 We put either my Tiva shoes or a sandwich bag of sand to get the boat to float at the right trim. First in small waves. This design does not move much in small waves. This is good. Next in small waves but there was some swell or passing boat that caused some rocking. 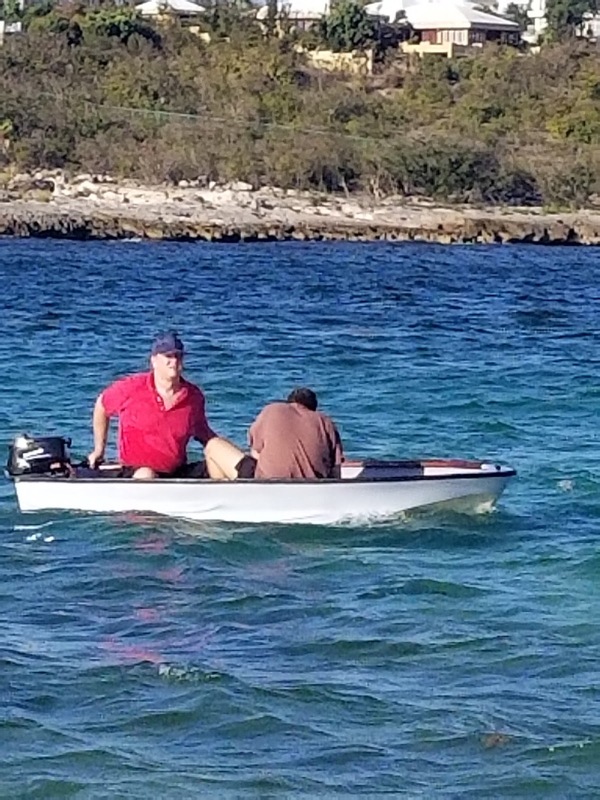 This is not ideal and I think if the center part of the float were to smoothly curve from the bottom to the top instead of just going straight up that up down motion would go away as waves more and so the boat would stop rocking faster. We will experiment with this new float shape in coming models. Next tested in a pool. Then what are sort of medium ocean waves for this sized model. Still looking good. And the same medium waves but also two large waves coming by. It handles these 2 large waves very well. Last some large confused waves. These are large enough that in real life you would try not to be in them. Like you would stay in a harbor if the full scale ocean was going to be this rough, or navigate to avoid a storm like this. But the boat must be able to survive these and probably even worse. I think it does fine. Teryn modified the 3D model so it has more waterline area. These are not as thin in the middle. These are a little bigger than the last set. However, we had not fix all the overhangs of more than 45 degrees and so it leaked. We put on some waterproofing but it was not enough and some still leaked. The test below was this morning and Teryn has since fixed the design and we started printing on the next set of 4 floats. These will be even bigger. Slow-mo but since the front edge is touching water it is not really working the way it is supposed to yet. 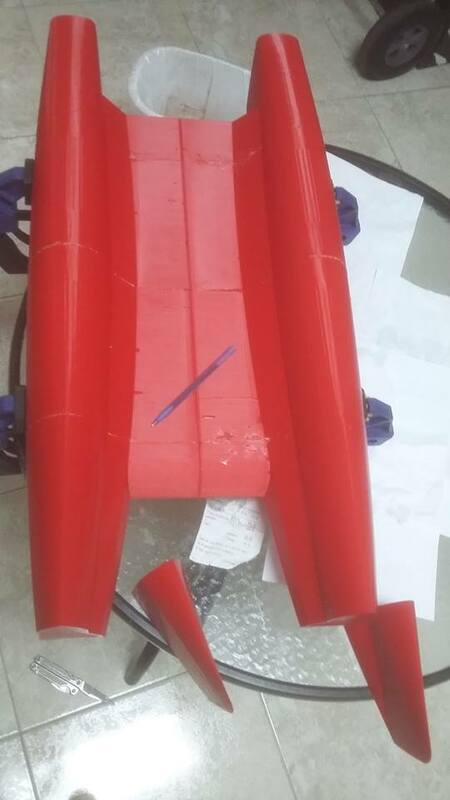 Next version in a few days (about 1 day to print each float).